We have become weighed down by gravity so much, that it has come to shrink our very statures. Earth used to have less of a gravitational pull, allowing humans to grow much much larger, I believe so large that it would stagger all of our imaginations, if we were to know the truth of how titanic humanity really was. After all, the Earth itself was radically different, why wouldn’t man not be radically different as well? Here is what main-stream science, and atheistic rational thought fail to comprehend, that humans could truly grow to giant sizes, and thrive billions of years ago, within the radically different climate of prehistoric Earth. Yet, it is exactly what mainstream religion’s have been saying for centuries. What everyone fails to account for when dealing with the people of the bible and holy texts, is that their environment was radically different than ours today, and as a result, they themselves were radically different than us. To them, gravity perhaps may not have existed as it does today, giving them the sense that they could never be tired or worn out, and that they were somehow super-human. Whereas today, if we overexert ourselves, we start to lose our breath and become tired, because it is the nature of how the Earth’s gravity and atmosphere has changed over billions of years. I use to think if we could take ourselves back to prehistoric Earth, we would be crushed by the weight of the atmosphere, and the strength of an overactive electromagnetic current from Earth, but now I’m realizing that it would be just the opposite. We would feel as light as a feather, and we would be like the insects today, who are able to fall from a great height and not even hurt themselves. We too might fall from a great height and only suffer minimal injury, at the worst, once we connected with Earth. That’s why they say Achilles would be but a blurry apparition on the battle field, partly because his atmosphere allowed him to move much faster, with much less overexertion on his part, and also because he was simply a marvelous warrior. I believe his atmosphere allowed him more freedom of movement, than if he were suddenly thrown into our modern world. Giants really did exist, because their atmosphere allowed them to exist, plain and simple. Earth was once much smaller, but it grew to almost three times its former size, and in the process became hollower. This would mean the old terrain is now way up, almost out of range of where its original stratosphere ended, maybe we are know almost up in the original mesosphere of prehistoric Earth! Gravity really should become stronger because we are now having to feel the effects of the internal magnetic field and the external pressures of the Sun’s solar wind bearing down upon it, at a much greater degree, and at a much greater height than in prehistoric times, because we have essentially been pushed up against the very fringes of where Earth’s old atmosphere used to meet with outer space. This to me explains the effects of gravity a little bit better, and how it has taken its toll on our very life force. I know most of you might not understand, and the way I explained it probably made absolutely no sense to you, but I understand now. As I was walking outside, I was looking at the cars that were stopped and waiting for the red light, and I saw a big white semi-truck with it’s muffler spewing smoke into the air, it was then I felt like I was walking upon the surface of a world that was just under the fringe of outer-space, and that it’s atmosphere was much thinner than it used to be. I felt everything was now accustomed to a much thinner, but more pressurized atmosphere, but we no longer notice it’s effects, it just feels natural to us now. We’ve evolved and adapted to hi-tech machinery and gadgets to better cope within an atmosphere now much more heavily weighed down by gravity. It’s not that our lives have become more hi-tech, it is simply the way nature itself has evolved, after all, we ourselves are always a part of nature and never apart from it. If the world continued to expand and we continued to shrink, It would become something like a death-star, in that all we would know was but a brief life, very fast paced and super hi-tech. But unfortunately, very short longevity, because of the immensely demanding electromagnetic force being exerted down, upon all terrain life. The life force of nature would be stunted to the point were the forests would resemble grassy fields instead . . . and perhaps all sentient life forms would finally end up as small as the insects today. The crust would become thin enough to support just the tiniest of life-forms, accustomed to much stronger gravity as their atmosphere continued to be squeezed and spread further and further out into the fringes of space. It’s very electromagnetic influence upon Earth maybe becoming so severe that the green hues of the continents might’ve long turned to hues of grey and black, as Earth would now require less oxygen for its devastatingly shrunken life-forms. Life-forms which although only the size of insects, might be so imbued with the divine spark of the creator, that they make Earth appear like a second Sun within the solar-system. With technology surpassing even their own collective conscious. Their methodical tasks might be executed with such speed and beauty it could be compared to how a hummingbirds wings might flutter in the air. Their minds could work as a global network, or hive of trillions of smaller circuits which form the overall super consciousness of what has become once again, a super hi-tech Earth. Maybe we would begin to see a landscape etched with what appeared as the work of something divinely intelligent, now inhabited, and kept artificially alive by a vastly shrunken human society, who no longer display individual human personalities, but only express themselves through a kind of divinely cognitive interaction as they go about their daily tasks. Or simply we would appear just as we do today, but only four or five inches tall. Again, I am going to have to assume a human this size would be accustomed to a radically different atmosphere, and gravitational pull than we are. But their gravity would be much stronger than ours, thus their lifespans would be much shorter. Their impulsive nature might lend them to become more violent, because their shrunken brains could only process raw thought and emotions, making it harder for them to control. Maybe this could be how we might become, or perhaps their is already a world like this that exists, somewhere out their. The older I get, the more I view our society as shrunken humans, the more it makes sense to me, simply from the way I’ve seen some people act. I am not trying to put anyone down, but it seems as if all the people I know act too immature. They see someone different, who may live a different life, or act differently, and it seems to have this effect on them where they almost become obsessive-compulsive. I’m beginning to find that most people have this disorder to some degree or another. They begin to act immature, and they no longer focus on themselves, but they focus on the trivial things, that are absolutely not worth spending any thought or time on. This to me is how a shrunken person acts. Society also acts this way, we come across another sub-culture that may be different, and we immediately want to impose our will upon them, and start trivial wars with them, over trivial matters that if we just lived and let be, ours and their lives would be much more peaceful and we could focus on bettering ourselves again. Instead we have to start trivial dramas, all over money and power . . . but what is it all really for? There has to be something bigger, behind the scenes, driving us to this madness. I believe it is the forces of death weighing down upon us, and we have come to think of it as Satan, but it is simply the opposing forces of nature which have been manipulating us for eons. The Earth’s surface can be compared to the epidermal cells of our own bodies, and we as humans, inhabiting the terrain, contribute to the outermost layer. I was just thinking about an accident that occurred to me in 2011, I burnt the skin on my face, just under the eyes, first, through traditional sun-burn, and then further damage occurred from the bulb lamp on my desk. The heat emanating from the bulb made the sun-burns several times worse, and I ended up with at least second degree burns under my eyes . . . the side I had decided to put my face up closer to the bulb was much worse. I honestly believe I was temporarily insane, I had just come back from my second tour in Iraq, and had once again taken up drinking when I should have quite for good. I believe anxiety and the early signs of alcohol withdrawal were just beginning to take their tole on my mind and body. Today, I am almost 100% healed, it took twelve bottles of facial serum oil, and several other skin serums to get my face back to normal, and I know that if I were to use a thirteenth bottle, my face would be 100% back to how it was before the accident occurred, it would look as if the accident never occurred at all. I know it may seem like I am treading off the beaten path, but give me time . . . most think the number thirteen is an unlucky number, but I am coming to find out that it is quite the opposite. I’m also realizing the catastrophe which happened on my face is like an infinitesimal version of what is happening to the Earth. The Earth’s cell’s were damaged a long time ago, our short lifespans, and high death rates attest to this. Every day, millions die around the world, through catastrophes, massacres and wars, it is like the cells on my own face that were killed by the natural heat of the sun (natural catastrophes), and the artificial heat of the lamp (man made wars and massacre). And now, God is applying his own oil, to finish off all of those dead and dying cells, and replace them with new, healthy ones. But it is not only the Earth he is doing this to, he’s doing this to the entire Universe. Like our own cells, we, as walking and talking cells, have no idea what’s really going on with our mother Earth. Like the cells in own bodies, we lack awareness of the overall ‘sentience’ of this organism which we’ve come to call Earth, we have no true comprehension of what the Earth is really experiencing, thinking and feeling, we’re just microscopic components of it, contributing to it’s overall being. When one of us dies, another takes our place simply by being born, just like the cells in our own bodies. Sometimes I notice the freeway, with all the cars traveling down it’s lanes, which are separated going north and south, or east and west. It always looks to me like a vein or artery, and I see the cars as a sort of transformed cell, which perhaps has developed a new but temporary cell coat or membrane. It’s controlled by the original cell which now inhabits it, telling it where to go. Like our own blood cells, some travel up to our brains, others travel down to our lower extremities, but they are all alive, and they all carry out their own individual tasks within the larger organism or organ, which is the city, or country. Like I said before, the Earth is in the process of repairing itself, or cleaning it’s ‘system’ out of all the ‘bad’ cells, bacteria and so on, and soon it will be a much healthier planet. But right now, it is sick and damaged . . . it has been this way for a long long time. Only the Earth knows, and has seen all that has transpired over the billions of years of it’s life. If only we really knew what the Earth knows, just think how different this world would be! Like us, it grew, got older, and it too will die. Taking this a bit further, we can view our solar-system as one minute component of a much much larger organism that is God. Our solar-system is structured similar to that of an atom, the Sun being some type of nucleus, and the orbiting planets being like the electrons that orbit around the nucleus of an atom. Their must be something special about this type of formation in all natural things, I think it tells us a little about the nature of God. That everything is connected in this way, everything has a central object that it orbits, whether it be the nucleus of an atom or cell, a heavenly body such as the Sun, the vast super-massive black hole at the center of a galaxy . . . or something even greater, that we’re not aware of . . . that the entire universe orbits around. They theorize the universe may have been created through a ‘big bang’, that all the galaxies are flying out from a central point in all directions. I believe this is true, because everything else in the universe is modeled in a similar fashion, in that everything else revolves, or emanates out from a central anchor point, this is how God creates everything else under him in his own likeness, everything created within the universe is in the likeness of its original parent form. The way the galaxies are spreading themselves out could be in such a way that they arc, or curve around from their point of origin, so that they form a massive swirling formation, around something that we will never be able to see, know or comprehend. They say the active galaxies appear to require a compact energy source of enormous strength, maybe at the core of the universe is a black hole so massive that it’s able to create the illusion of reality, by maintaining order amongst the galaxies through a particular type of formation, as they appear to fly in an outward direction. And we are just microscopic components of it, like our own atoms are microscopic components of ourselves. Even more astounding, it’s now theorized the galaxies, which have been spreading themselves out in all directions for eons, are now slowing down! This tells me that everything truly is connected, and it’s not just our own solar-system which has been out of balance, it has been the entire universe which has apparently gone through some type of fall, being out of balance all along. If the outward spreading from the big-bang is indeed slowing down than we must be on the cusp of some momentous event, which will occur within our own neighborhood amongst the stars in the not too distant future. When the Earth was first created, it must have been not too long after the big-bang, in terms of the lifetime of this Universe, because the Earth was much smaller, and humans were much larger. But as the Universe continued to spread outward, further and further into the realm of the unknown, our own planet Earth began to grow larger, as if the Universe itself was stretching her out, and depleting her inhabitants of all their life force . . . shrinking them in stature, and diminishing their spirits. Our cells are alive, but we elude them, God is alive, be he eludes us. Perhaps it is somehow creating or perpetuating the illusion of reality from the very center of this particular universe, and the closer you may get to it, the more vivid reality might become. Our reality is but one of many located within separate dimensions, and what makes our reality unique is the nature of physicality. Our more concrete, physical universe is a ‘organ’, like other universes or dimensions, but they may be completely different. Each universe may serve as the bodily parts of some vast and unimaginable organism. The only way to come close to comprehending this ‘unknowable’ organism might be through death, and death alone, after all, they say in death it’s more vivid than it is in life. Then, we might be able to catch a glimpse of this entity, or entities, but even in death I do not think we’ll fully know it, whatever ‘it’ may be. I don’t think it will ever be truly known by anything other than itself. Because just as our own atoms and cells do not know us, we will never know it. So I guess true knowledge really is knowing you know nothing at all. Adam’s race is born as immense electromagnetic apparitions, which emanate out from the base of the ice-water canopy, hanging above Earth like a great crystal veil. These embryonic spirits of Adam’s race are the featureless sole archetypes of all the manifestations of man who will descend afterward. 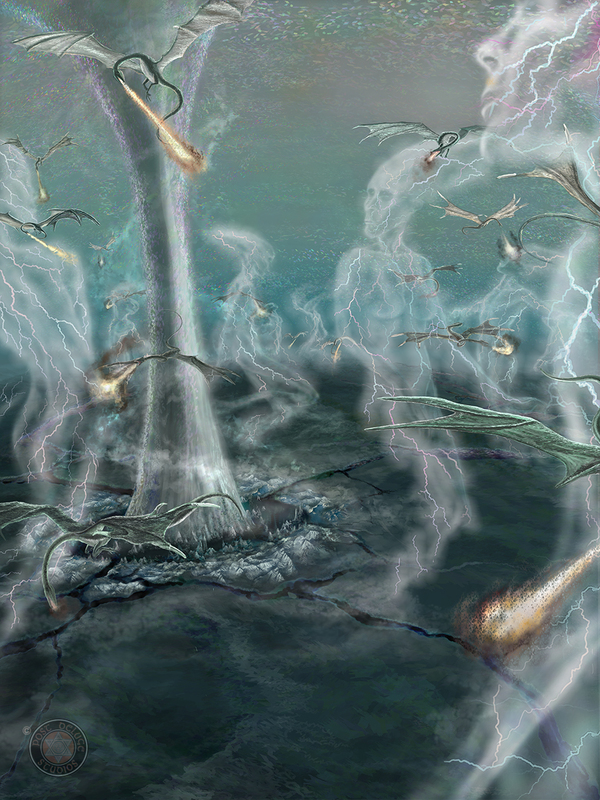 They violently permeate the deceptively arctic atmosphere with their veins and arteries, which appear like lightning. The four great rivers of Genesis run through Earth’s bountiful flora, like fragile cracks, revealing a vast oasis underneath, as they already form the outlines of the early super continents. Ciaker’s donate their seed to the birth of man by spitting torrents of fire into the atmosphere to assist her watchers be rebon into gradually solidifying living giants, entering from the spiritual, into their physical manifestations over great amounts of time. This may not be a coincidence at all, I believe there were external influences involved in Robbin Williams Death, within Hollywood. Someone working within the Studio which produces Family Guy must have had inside knowledge regarding his death. This is not the first incidence of a ‘strange coincidence’ involving a Family Guy episode, coinciding within a real life event of an actor’s untimely death. This sort of ‘strange coincidence’ has happened before, with the Boston Marathon Bombing, as well as with the Death of the Fast and Furious actor Paul Walker. I believe this is just another example of how our minds are beginning to meld back together globally. It is a fact that ancient tribes were only able to operate as a tribe. One would never refer to themselves in the first person, it was always we, or us, and never I. They were more comfortable when they were together as a tribe, to be alone meant uncertainty and confusion, and to be banished from a tribe was the ultimate punishment. Today, our mentalities have become so individualized that we are cut off from external events that we don’t see with our own eyes, or hear with our own ears. But that is beginning to change again, and the secrets the global elite have been keeping from us are beginning to seep back into our conscious. Because our minds are beginning to meld back together, on a global scale. Gangs and tribes will become stronger, and more unified. We are beginning to wake up to the way this world has been operating, and the secrets the global elite have been keeping will no longer remain as secrets. I believe the global elite have been killing off our celebrities for decades, we are just beginning to wake up to this fact. This is how cold, and evil they have become. Many celebrities have been the victims of Illuminati sacrifice, I’m not saying Robbin Williams death was, but his death still struck me as strange, and untimely, as well as the deaths of many other celebrities before him. Perhaps we are entering a time when our global elite need more and more human sacrifices to maintain their control over the world. And soon, the natural order of the universe will become so unmaintainable to them, that they will eventually, completely lose control . . . after all, they say we are on the verge of another economic collapse, perhaps that will mark the beginning of a new world order. There is a shadow government operating nationally and globally, it is working toward a global unification, similar to the United States, but on a global scale. I believe England, the Vatican and Israel are the main nerve centers of this shadow government, and it’s referred to as the N.W.O. (new world order). Ever wonder why the shadow government is so desperate to take out countries it does not financially control? Because those countries are almost always debt free. They are disconnected from the established central banks, owned by the Illuminati backed banking cartels. I think the U.S. became official property of England after Theodore Roosevelt took over presidency from Mckinely, who was assassinated for his anti-British, American System style of diplomacy. One of his planned projects was the Trans-Siberian Railway, connecting North America with Asia. Roosevelt was against the established American System, because he cut funding for that planned project, I don’t know the exact reasoning behind it, but I know England would harvest poppy seeds in South Africa, and export them as Opium to China, and if the U.S. was connected directly to Asia, it would have an adverse effect on their grip on world power. The Progressive/Bull Moose Parties, the splinter Republican Parties Theodore Roosevelt belonged to, must have had ties to England, because he became president, and was able to implement his anti-railroad/pro-England agendas, helping keep England as the dominant force in world trade. Then WW1 and WW2 happened, shaking the foundation of England’s ever increasing grip on world power, and directly following WW2 the Bilderburg Group was formed in the early fifties. They would ensure that another uprising like the Nazi’s would never happen again, or if it did, would be directly controlled by none other than themselves. They are highly knowledgeable in sorcery, but the general public mistakes it as satanism, which some of it may be, but I believe the broader scope is sorcery, which they practice in order to maintain control and contact the extraterrestrials living within the 4th dimension. These beings hold a higher, more ancient power with the world. In order for these off world races to maintain their power, they must administer these shadow governments, and oversee their activities. If you have not noticed, they are the ones deceiving us, otherwise they would be more friendly and open towards us, and we would know EVERYTHING about them. But we are living in hell, we were the angels, originally bound with chains and condemned to darkness after exiting Eden. We were the ones destined to be born into and exist in a state of suffering and disillusion. But after billions of years of steady degradation, turning the world into a distorted mirror image of what it once was, it has finally come around to a new state of self awareness, so it is not just the people, it is the Earth itself which is waking up. like I said before, if you have not already noticed, there have been natural events taking place globally as well as outside our solar system, that are all triggering our evolution. The Kuiper Belt build-up which has been going on since the seventies, is yet another sign of a huge shift in consciousness. Those objects that we keep seeing, orbiting our solar system are in fact intelligent beings assisting our evolution back into higher dimensions. We as people, are just part of a larger shift in planetary consciousness that is currently taking place, and soon, we will be able to confront our true enemies, and speak to them face to face, once again. We will be able to once again speak to the invisible Reptillians, just as Adam and Eve were when they made a pact with them. We still live by that pact today, but instead of being faithful to it, we are slaves to it, no longer able to recall, or understand what exactly took place in the Garden of Eden, between Eve and her deceiver. Now, the knowledge of penetrating into higher dimensions is only known to the Illuminati bloodlines, that is why they are so adamant on keeping marriages in the family. It is also a sign of how damaged the Earth has become, and that is why the external terrain Earth is in the state that it is politically and ecologically. True freedom/power really is held by the 1%, who are allowed to manipulate the world through sorcery, while everyone else is basically born into the ignorance of the general public, not knowing the true intent behind their political parties, or the true meaning behind what they see in the media. But change can never happen overnight, it can only happen as the Earth changes, because everything is connected to the Earth itself. So when we believe that we are damaging the ozone with fuel emissions, it is in fact the Earth repairing herself, through us, by introducing more greenhouse gases into her atmosphere, which is actually how it was in prehistoric times, the atmosphere was packed much denser with greenhouse gases, and was thicker than it is today. Fossil fuel emissions are detrimental to our health however, because imagine an entire atmosphere with 10-21% Carbon Dioxide and only four or five percent Oxygen, we would die within minutes. However, this was more like how it was in Prehistoric times, and yet, humans were somehow capable of living in this kind of environment. I believe that is what will happen in the future, we will continue to manufacture and use cars as our primary means of travel, for thousands, if not even millions of years to come. Imagine how the atmosphere may change after millions of years of steady fossil fuel emissions entering it, we may not be able to live in that kind of environment, but perhaps our distant descendents somehow will, through millions of years of adapting to it. We operate through the actions of the Earth itself, and we never do anything external from the Earth, because we’ve always been, and always will be one and the same. The ones living way down on the opposite side of the crust, are already aware of this, and they are having almost the opposite experience we are having on the external Earth. As a result of their environment, they exist in a state of peace, and belong to the inner earth holy kingdom, It’s their version of Israel, it is the true Israel, where the true Israelites migrated many thousands of years ago. This was after the arrival of the moon, which began to stretch Earth out like a balloon, creating another world inside, for God’s chosen people. These are the ones who will ultimately come back out and reestablish world peace, such as in the time of Adam and Eve, during their days in the garden of Eden. And as prophesied, that great serpent, Lucifer, the one who deceived the entire world will be cast back out, who are the Reptillians, and their great central sun, influencing external global events from the internal Earth and the fourth dimension.